From March to September of 1940, Arthur Cerasani, a sculptor and artist from Rochester, New York, worked on Mount Rushmore, while his family remained over fifteen hundred miles away. Over this vast distance, he and his wife, Mary, stayed connected through letters. Their daily correspondence reveals the trials of carving sixty-foot heads on a mountaintop and highlights the strength of the human spirit. Despite isolation, spring blizzards, summer heat, and the unpredictable moods and fortunes of master sculptor Gutzon Borglum, Arthur Cerasani manages to connect with the carvers of the great monument and grow as an artist. In telling his father's story, Richard Cerasani gives readers the tale of many workers on the mountain, some separated from family, all hoping for a future. Using letters and photographs, he shows the human side of the monumental struggle to create Mount Rushmore National Memorial. 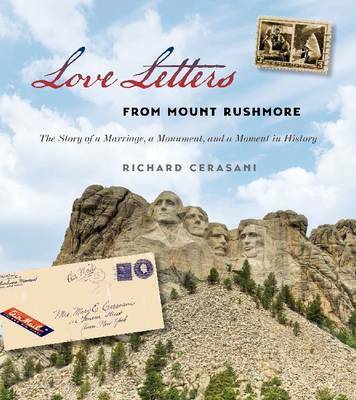 "Love Letters is a volume of uncommon originality and depth, richly illustrated with photographs from the carving era, many of them unfamiliar. The combination makes a wonderful addition to the Rushmore story." -- South Dakota Magazine "http://www.southdakotamagazine.com/"
Richard Cerasani and the South Dakota Historical Society Press "have produced a very impressive book. [The] storytelling is very engaging. I would say that it is probably the most graphic description of what work on the mountain was like." -- Robin Borglum Kennedy, The Borglum Estate "http://www.godakota.com/editorial.asp?read-about=gold-choice-award"